The popular doughnut shop opening at a key corner is part of the goal to attract a mix of established retailers, restaurants and professionals. 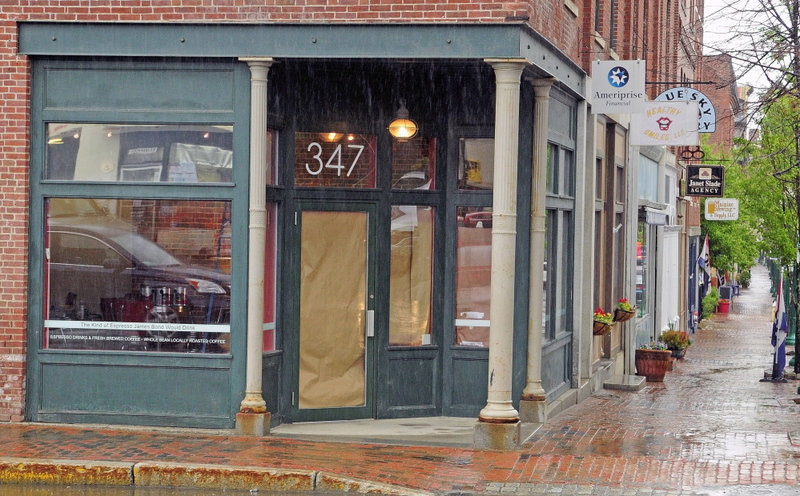 A popular Maine doughnut shop that first opened in Brunswick a half-century ago is opening a fourth location in downtown Gardiner later this month with the help of a new incentives program launched by city and downtown leaders. Frosty’s Donuts, under new ownership since 2012, will open at the corner of U.S. Route 201 and Water Street. The owners of the quickly expanding doughnut business say the financial incentives they’re getting from the program are crucial, but the efforts by the city and the downtown organization spearheading the program also influenced the decision to come to Gardiner. The program, Gardiner Growth Initiative, is a collaboration between Gardiner Main Street, The Bank of Maine, the Gardiner Board of Trade and the city. It came out of strategic planning meetings two years ago with the bank, the city and other downtown groups and supporters. Businesses can apply for forgivable loans for infrastructure costs, grants for working capital and free rent for long-term leases if a landlord is part of the program. Large businesses in the city have also pledged to support the new businesses, and the city is offering tax incentives for specific infrastructure improvements to downtown buildings. The goal is to attract a mix of established retailers, restaurants and professional service providers that will boost foot traffic and the economic fortunes for all downtown business. Gardiner Main Street, a nonprofit organization that aims to revitalize downtown, identified types of businesses to attract with the program including restaurants with space for live music, places for family entertainment, medical services and specialty retailers. 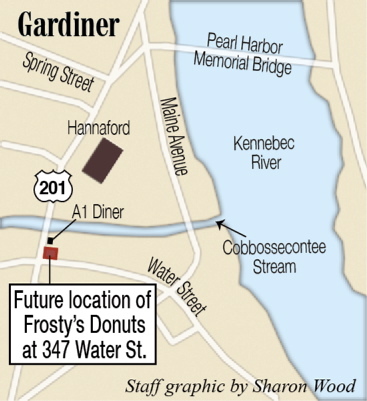 A bakery — and specifically Frosty’s Donuts — was suggested as a business the group wanted to attract, said Patrick Wright, executive director of Gardiner Main Street. He had reached out to the owners, Nels and Shelby Omdal, last year before the program was finalized. Since the husband and wife team bought the business two years ago, they’ve opened two new locations and developed wholesale accounts for their doughnuts, including 11 Hannaford supermarkets. They have plans to expand into more Hannaford stores this year — including Gardiner and Augusta — sometime after the Gardiner Frosty’s opens. They’re in process of opening a production headquarters at Brunswick Landing, which will allow them to expand their wholesale business. They’re also planning to make ice cream soon as well. “That will be a whole new fun thing to roll out with Gardiner,” Shelby Omdal said. They plan to open the store at 9 a.m. Saturday, June 21. Interior work at the new store is underway, and soon the outside of the building will match the red-and-white paint job of the inside and of the other Frosty’s in Brunswick, Bath and Freeport. The Omdal’s business has grown to 25 full-time employees, up from four when they bought it in 2012, and they plan to add six to eight for the Gardiner store, Nels Omdal said. Most of the doughnuts will be made and shipped from Brunswick, just like at the Bath and Freeport stores, but the Gardiner location will have a fry station to make some fresh donuts onsite. Shelby Omdal said Gardiner was already on their radar because they heard from “slews of customers” telling them that their store reminded them of MacDonald’s Bakery — a bakery that made doughnuts in downtown Gardiner for years until it closed in 2006. Nate Rudy, economic and community development director for Gardiner, said he thinks the good will leftover from MacDonald’s Bakery will serve Frosty’s well. The location of the new doughnut shop is in a key, marquee downtown storefront, Rudy said. The corner of U.S. Route 201 and Water Street has the highest traffic count of any downtown corner, and it’s seen by drivers coming through Gardiner to get to Interstate 95 or 295. It’s been empty since Water Street Cafe closed in January. Both Rudy and Wright said another benefit of the business opening in Gardiner is the volume of walk-in traffic it will attract. Other municipalities offer different types of financial help to businesses in the form of loans and other incentives, but the Gardiner program appears to be unique in how targeted and comprehensive it is. Peter Thompson, president of the Kennebec Valley Chamber of Commerce, said he hasn’t seen many similar programs, but he expects other municipalities will be monitoring its effectiveness. Another thing that makes it unique, Thompson said, is the substantial investment of $125,000 from The Bank of Maine to fund the forgivable loan portion. “It’s kind of hard to replicate that in every community, but there are ways to do things, pick and choose from this menu, to achieve the same goals,” he said. Businesses can apply for loans worth up to $50,000 that will be forgiven if the businesses stay in the city for at least five years. The loans must be used for fixed assets and infrastructure investments. The city is administering the loan program, but no taxpayer dollars are being used to fund it. The Gardiner Board of Trade gave $50,000 for grants worth up to $10,000 that can be used for working capital such as inventory. John Everets, the president and CEO of The Bank of Maine, said he sees it as an investment in a community the bank has operated in for around 180 years. Everets said attracting more expanding businesses to the downtown will help everyone in the city, including the bank. The hope is if the program leads to a growth in businesses, some of them will use The Bank of Maine for additional banking and lending needs, he said. “Creating a strong, vibrant, healthy business community in Gardiner helps the bank, helps the town, helps all the citizens in the town and helps all the businesses in the town,” Everets said. So far, no other businesses have been approved for the program, which is running until at least the end of the year.